A person who adds camouflage to things is called a camoufleur. 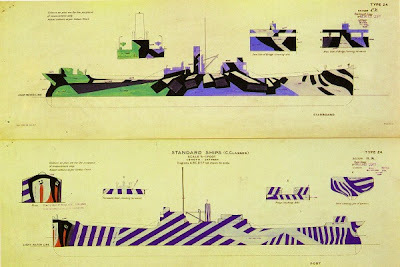 When pressed into the difficult work of camouflaging sea-going vessels during the First World War, they all decided not to. The British camofleurs really enjoyed Cubist painting. They liked looking at the lines and feeling confused. 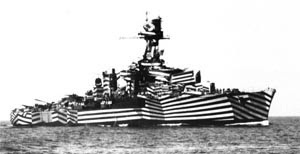 For the duration of the first world war, naval camofleurs gave up the ghost. They came to terms with the fact that nobody can hide corvettes. They rallied behind the Cubist standard, vowed to further its confusing nature into the frothy oceans! 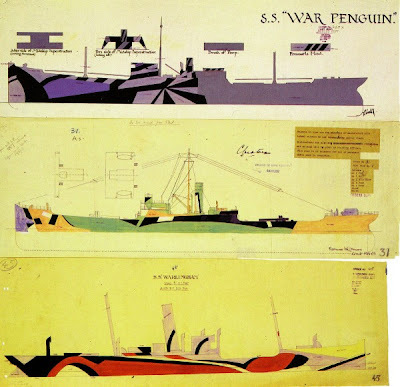 In covering these hideous gunboats in wildly attractive patterns, they hoped it would prove very difficult for enemy range finders to get an accurate bearing on the distance, heading, and speed of these vessels because of their mass being all broken up by odd colour fields, false bows and complex line art. There are plenty of black and white images out there. The colours have been digitally suggested in this photograph. Best part : There's really no evidence to suggest the paint schemes were very effective. Posted by Greg at 9:10 a.m. I'd seen very large pictures of this sort of paint and always thought it a funny and not very sneaky way to go about hiding a ship.